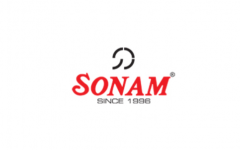 Business description - Sonam Clock is a clock manufacturing company situated in Morbi, Gujarat. The company offers a wide range of table and wall clocks at various price points across budget, mid-level and premium styles. It offers clocks from a price range of INR100 to INR1800 which includes LED digital clocks, LCD clocks, light sensor clocks, pendulum clocks, musical clocks, rotating pendulum musical clocks, sweep clocks, office clocks, designer clocks, alarm clocks, table clocks and regular clocks. The company also offers customized corporate clocks in bulk quantities for corporate gifting purpose. Its products are sold mainly to clock dealers, retailers, corporates, gifts and novelties stores, through which it reaches to end consumers. Its products are sold under the brand name of Sonam, ampm and Lotus. In FY 2016-17, its net revenue from operations comprised of INR3792.85 lakhs, of which approximately 40% comprised of export sales to Middle - East countries such as Dubai and Iraq. Its Manufacturing facility is located in Morbi, Gujarat. Sonam Clock IPO allotment status is now available on Bigshare Services' website. Click on this link to get allotment status.